The theme of my last few posts seems to be two statues from the same series, so why not two statues that are actually a set? I'm not particularly enamored with modern mainstream comics at the moment, but one property that has really captured my interest in recent times is what's been happening in the Hulk corner of the Marvel Universe. That's really saying something for me, since my only interest in Hulk previous was his founding role in my favourite non-team, The Defenders. However, the momentum that started with Planet Hulk and has kept strong through the Red Hulk / Red She-Hulk sagas has really drawn me in and kept me coming back. 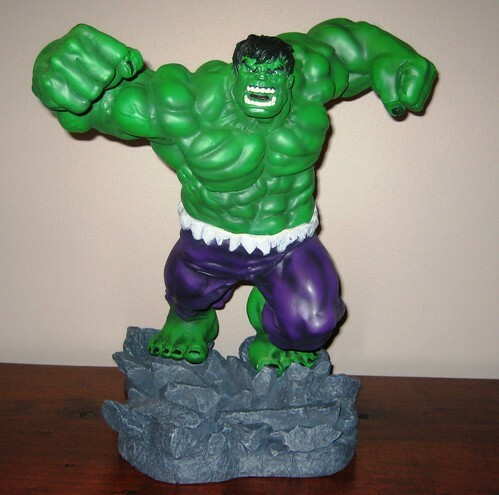 As such, I knew as soon as I saw the previews for Kotobukiya's Fall of the Hulks Fine Art Statue Set, with one Hulk each of the Green and Red varieties, that I would end up owning them. The pieces are great on their own, but as a complimentary set they just couldn't be passed by. Thankfully Father's Day (first Sunday in September here in Oz) was coming up, so I asked for something red and something green, and thankfully I didn't end up with apples! These statues are just plain amazing, and not just because of their size. They are incredibly well sculpted for starters and capture the characters brilliantly - from beautifully detailed musculature to rippled and ripped fabric to great headsculpts which capture the characters fantastically, these have been set up to be perfect. Green Hulk gets a perfect score for me. A fantastically dynamic pose is uses here and it works well on its own as well as in the set - he looks absolutely stunning facing front-on but looks great from the side as well. The headsculpt is brilliant - truly classic Hulk. His muscle definition is well sculpted. This is all supported by an excellent paint job - the green used on his skin gives quite a sense of depth and tone, while a light wash over his purple trousers provides a feeling of texture. This is just an amazing statue. 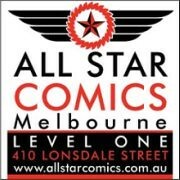 A must for any serious Bruce Banner fan! 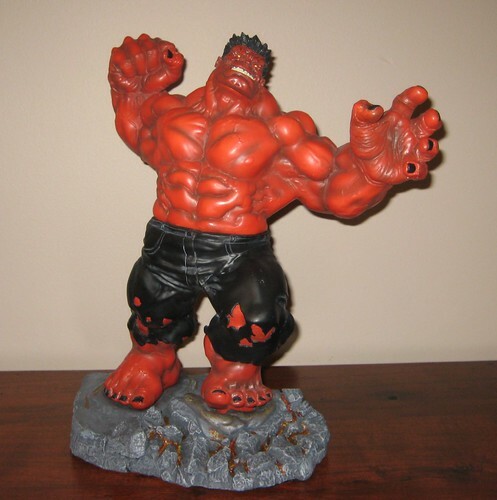 Red Hulk comes with an added feature: two swappable heads, once featuring an angry face and the other a wicked smile. It's the evil smile face that's on display at my place. Really, I think it was this headsculpt that sold me on the whole set because it really captures Rulk perfectly. Again, this statue looks great from front and side angles and would display well on it's own. While I'm extremely happy with this piece, there are a couple of factors that keep me from ranking it quite as highly as its Green counterpart. The sculpting on this piece is as equally well done, but the paint isn't quite as perfect - a wash has been used on the red paint of Rulk's skin that makes it look a little grotty, and the red paint on both heads is a tad darker than the skin. Neither are deal breakers but they are things I'd look to improve if I could. These are truly massive pieces and incredibly heavy to boot - make sure you check the maximum load bearing of any shelf you plan to display the two of them on together! Thankfully they're designed to face each other in battle pose as they'd be too broad to fit in my display facing the front. Too hefty for pegs or pins, these have quite large blocks on the bottom of the feet which slot into holes in the base and they both stand very steadily. I haven't bought into Koto's Fine Art Statue line overall, as some of the headsculpts are bit lacking and they haven't yet moved much beyond the top tier characters, but some of their upcoming Danger Room statues potentially look appealing. For larger statues like these, however, they are far more economical than their competitors, especially when international shipping is involved! 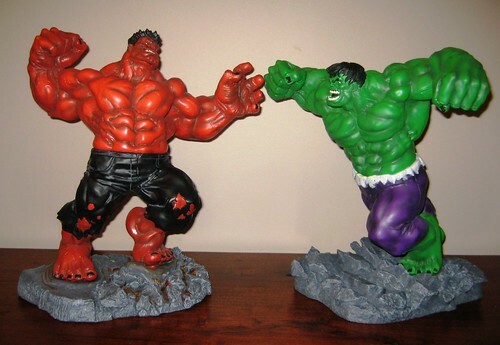 I also think these two statues stand up very well against Hulk product from other producers. They certainly stand up extremely well in my collection!! You can see more pics at Facebook, discuss this at the AFB Forum, and comment on this post to enter the October AFB Comment of the Month Contest, with the added bonus of an AFB Facebook Fan winning an extra prize this month! Holy... Those are sweet! They look so much better than those MS Hulks. Superb Both green & red "HULK". Is my childhood most popular tv series. I still love the expression on Rulks face.